Among the new features in Apple’s latest operating system, which were unveiled two days ago at Apple’s developer’s conference, are a light update for the Emoji keyboard embedded on iPhone, iPad and iPod touch devices. 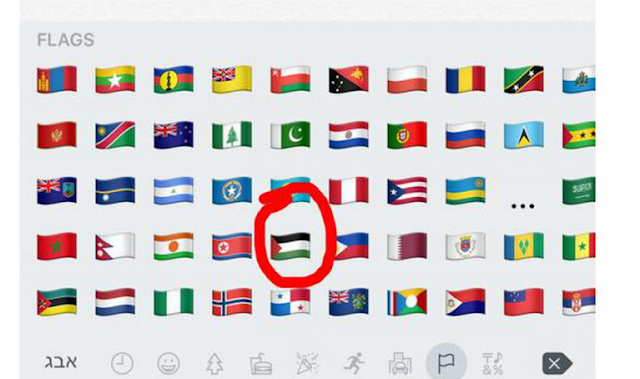 The sharp-eyed people among you will notice that Apple refreshed the flag pictures on the Emoji keyboard and added the flag of Palestine. In November 2012, ths UN’s General Assembly recognized Palestine as a country that is not a member of the organization. More than 100 countries consider the Palestinian National Authority as a political entity and some conduct diplomatic relationships with it. As of today, neither the U.S. nor the European Union recognize the Palestinian state. However in October, the prime minister of Sweden announced that his country would recognize the Palestinian state, and two weeks after that, the British parliament voted for recognition of the Palestinian state. Still, politics is one thing and business is another. While the diplomatic arena has a vigorous debate around this subject, a lot of companies have tried to refrain from taking a clear stance in this matter. In September 2012, as part of an update for Apple’s operating system iOS 6, Jerusalem was no longer presented as the capital of Israel. While the capital for each country appeared alongside its name, Jerusalem was omitted and one discovered that this led to quite the storm. Apple finally recanted, but this happened only after Israeli diplomats put pressure on them from behind the scene. In a similar case that received headlines last year, Google changed the definitions of its search engine so that the Palestinian Territories would appear as Palestine. Even though this is a relatively minor change, there were some who attacked the company for taking a political stance. Google gave a diplomatic response and explained that it consults many professionals before making these sort of changes and takes into consideration the international climate as well. The developer version of iOS 9 was released last Monday and Apple will release at least a 7 beta version, each with its own changes, before launching the official one. Thanks to Tom Ron that sent us the initial tip for this story. Rinat Korbet translated the original post.